A few weeks ago I had a terrifying experience at home that I now feel able to talk about without breaking down in tears! sounds dramatic I know, but when Rosie had a febrile seizure/convulsion I had no idea what to do, how to react, how to help … I felt completely useless. Febrile seizures / convulsions are surprisingly common among young children and usually occur at the beginning of a cold/virus. They happen when a the child’s temperature is too high and it’s the bodies natural way of shutting down and cooling down. On the day that it happened to Rosie, she was absolutely fine, showing no signs of becoming ill. One minute she was happily eating her dinner and the next she was shaking violently and then collapsed unconscious. Thankfully I was sitting next to her and was able to stop her from falling off her chair. The next fifteen minutes were the longest and most horrific fifteen minutes of my life. Holding little Rosie in my arms and running outside shouting for help was how I responded to the situation. I felt completely torn about what to do, I couldn’t remember the basics in first aid, let alone how to do CPR! Luckily my good friends / neighbours came running to our aid, called an ambulance and helped calm a screaming baby Ruby down. I was a trembling mess, struggling to stay calm and constantly feeling ashamed and angry at myself for not learning the basics in first aid. When the ambulance crew arrived they quickly calmed us all down and described how common these frightening seizures are, and that Rosie would be absolutely fine. I can’t describe the relief and emotions that rushed through me at this point. Rosie took about fifteen minutes to regain consciousness and was taken to hospital for a few checks. She came home about seven hours later. The next morning she had a cold and a cough. I spent the next day looking for a way that I could learn the basics in first aid, so that I would hopefully have a better idea of how to react in any future scary situations that may occur. Kate’s first aid sessions are tailored specifically for parents, carers etc. To help give confidence in handling the more common medical emergency situations. I can’t stress enough how much we all learnt from Kate. She had a wonderful way of teaching and I do actually feel more confident now about my knowledge in basic first aid. I just want to say a huge thank you to Kate for booking us in at such short notice and for being such a fantastic teacher! 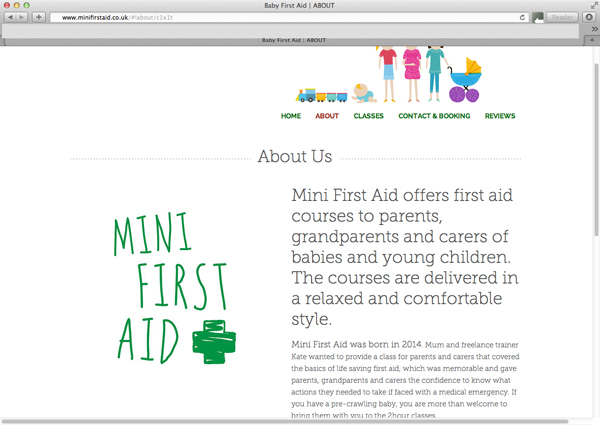 I will be recommending Mini First Aid to everyone. I was actually put to the test last week when Rosie cut her head open! I managed to remain calm and treat the wound correctly, and daddy took Rosie to the minor injuries unit nearby. Do you know first aid? do you know where your local minor injury units / hospitals are? Please please please learn the basics in first aid. Especially if you are a parent. You could save someones life. This entry was posted in Our life, Services we love ... and tagged febrile convulsions, febrile seizures, First aid, mini first aid. Bookmark the permalink.